GRAFENWOEHR, Germany — The USAG Bavaria Chaplain is issuing a garrison-wide pushup challenge beginning Veterans Day, Nov. 11, to generate more awareness of veteran suicide and as an opportunity to talk about resources. 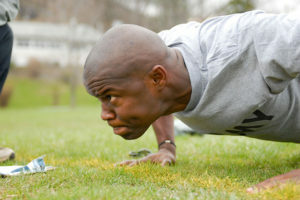 Officially launched by a non-profit in 2013, the 22-day pushup challenge is a social media initiative that uses videos of participants completing 22 pushups to spread awareness and demonstrate solidarity. The number is a reference to the Veterans Affairs statistic that, on average, 22 veterans commit suicide every day. The challenge will kick off at the Tower Barracks Main Store and Vilseck Red Cross Office on Veterans Day, Nov. 11 at 11:30 a.m. and end on Dec. 3 at 11:30 a.m. at the garrison Chaplain Office, located at Bldg. 555 on Tower Barracks. USAG Bavaria Chaplain, in conjunction with garrison leadership, American Red Cross and American Forces Network, or AFN, are banding together to coordinate the social media campaign. Those who require help need to know that seeking aid is a sign of strength and courage, Pies also said. Several resources are available to community members in need of help or support. U.S. Army chaplains and the Military Crisis Line offer non-medical, confidential counseling. The Chaplain Crisis Line operates 24-hours, seven days per week. The confidential counseling service can be reached at 0162-296-0838. Alternatively, Soldiers or DOD personnel can call the Military Crisis Line at 00800-1273-8255 or live-chat here. The Red Cross Hero App is available to servicemembers and their families with a free 24-hour call center that can help the service member find resources and assistance in times of emergency. The Red Cross team here at USAG Bavaria will host a few Reconnection Workshops through the end of the year. The workshops cover ways to identify depression, how to respond when others are depressed and how to help. The dates are Nov. 17, Dec. 1 and Dec. 15, and they all run from 5 – 7 p.m. These workshops are open to Soldiers, families (18+) and leaders. To register, call the Vilseck Red Cross office at 09662-83-1760. The Grafenwoehr Health Clinic and Red Cross will also host a Healing Arts session Nov. 17 from 10 a.m. to noon. Lunch is provided for all participants. To register, call the Health Clinic at DSN 590-3000, CIV 06371-9464-3000. During the 22-day period, chaplains’ offices and the Red Cross will be available to record anyone who wants to participate and log their progress. Certificates will be presented at the garrison Chaplain’s office to those who complete the 22-day challenge and do push ups every day in honor of veterans.